Construction of the new addition to the Delaware Area Career Center south campus is restarting after being halted for several months. 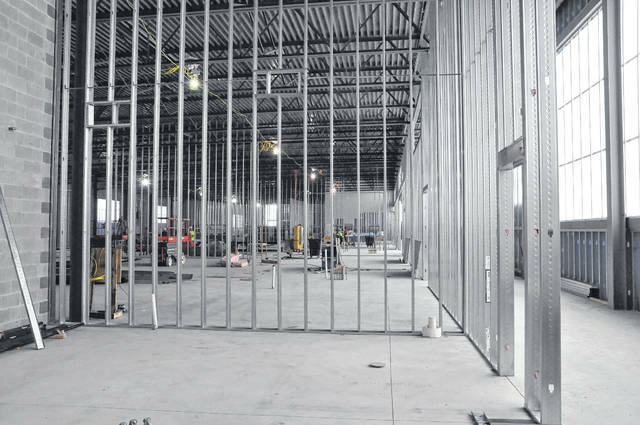 This is a view of the high bay labs under construction in the addition. These labs will house programs like construction, power line technicians, and powersports and diesel technology. This section of the construction project will be connected to the current south campus and house meeting rooms and classrooms. The second floor will be the home of digitial design and app development classes. The Delaware Area Career Center held a beam signing ceremony Friday to commemorate restarting construction on the consolidation project and to thank the staff, students, and community members who helped the career center in the last year. 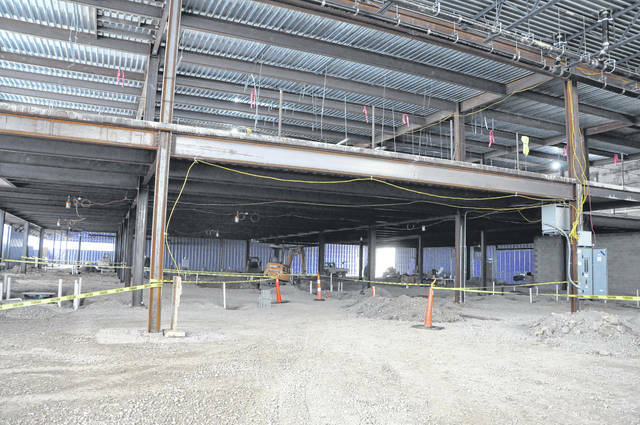 The DACC broke ground on the $45 million project to consolidate all of its programs into a 224,774 square-foot addition to the South Campus in October 2016, but learned in January that the renewal levy passed by Delaware County voters in 2015 did not appear on the ballot for 1,026 voters in Franklin, Marion, Morrow, and Union counties. The Ohio Department of Taxation refused to certify the levy. The board of education then made plans to pause construction when the new addition at South Campus was deemed structurally sound and planned to resume construction after a levy replacing the 2015 had been certified by the Delaware County Board of Elections. The board voted to pause the construction in May and voted in November to begin construction again. Construction officials told the board that the plan is to complete the new addition at the South Campus first in August 2018 and move the south programs into those facilities while crews renovate the current South Campus. The north programs will move to the consolidated campus in August 2019. Freeman also thanked local state representatives Andrew Brenner, R-Powell, and Rick Carfagna, R-Genoa Township, who authored House Bill 124, which extended the DACC renewal levy that was passed by voters in 2015, so the levy only had to be voted on in the other four counties in November. “H. Jackson Brown said ‘when you can’t change the direction of the wind, adjust your sails.’ Well, Representative Brenner and Representative Carfagna did just that when they authored House Bill 124,” Freeman said. Brenner and Carfagna also spoke at the event and said they were proud to have been able to help out the DACC. At the event Brenner, Carfagna, members of the DACC board, students, and construction officials signed a beam that will be installed in the new addition. Brenner, Carfagna, and the DACC board also took a tour of the ongoing construction.